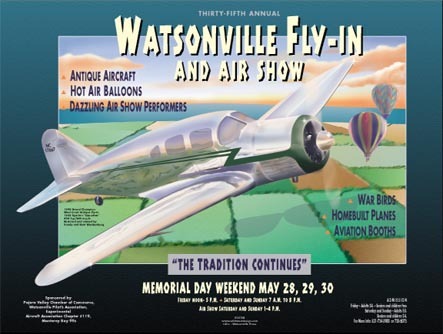 When at the last minute the promoters pulled out on the thirty-fifth annual Watsonville Fly In, one of California's premier antique airplane events. City Fathers called in Wild West Design to create a last minute poster and ad campaign. Exceeding all expectations the poster was featured on the front page of two local daily newspapers and local television. Like the poster the event was a huge success.